Manchester City midfielder Patrick Vieira has been suspended for three matches after accepting a Football Association charge of violent conduct. The Frenchman was charged after an incident with Stoke's Glenn Whelan during Tuesday's 1-1 draw, when Vieira appeared to kick out at the midfielder. He escaped punishment during the match but was found guilty on video evidence. He will now miss league matches against Liverpool and Chelsea, plus an FA Cup fifth-round replay versus Stoke. If Vieira had contested the charge and been found guilty, he could have been banned for an extra game. Stoke manager Tony Pulis stated following Tuesday's league tie that he wanted parity after one of his players, Robert Huth, was suspended earlier in the season following the use of video evidence. Does anyone think that this might be a blessing in disguise as Mancini might abandon the idea of playing 3 DM's? The German was forced to sit out three games after cameras caught him lashing out at West Ham's Matthew Upson in October. "We had a player given a three-game suspension after an incident a couple of months back," said Pulis after the match. "There were incidents in the first half with Man City players where I think it is as bad if not worse." Vieira is no stranger to the FA or disciplinary action having been sent off 10 times in his nine years at Arsenal before leaving for Juventus in 2005. The Frenchman was also booked on 100 occasions while playing for the Gunners. He was shown another yellow card against Stoke for a separate incident and also had his name taken on his City debut at Hull earlier this month. 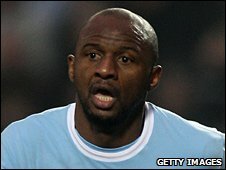 Vieira joined City on a free transfer from Inter Milan in one of the most eye-catching deals of the January window.